A Thread that does what it says on the tin, to talk about PSVR and it's games and if your thinking about getting etc. The PSVR is out worldwide October for £349.99 / $550 for those down under but it seems EB games have sold out of launch units already and will come with PlayRoom VR but you do need a PlayStation Camera on top to use, in the states it has been confirmed there will be a bundle with a camera and move but no word on price. All games will use the Dual Shock 4 but some will also work with Move or Moves as I recently watched a trailer for Tumble which is a Move game and there using a Dual Shock 4 in the trailer but it looks a little bit awkward that a Move would be better I think, also in the trailer for London Heist which use the DS4 like all games there using two moves as the player is pointing the move as where they want to aim the gun on screen. I can't see Moves being that expensive or hard to find and the other two you have to buy the motion controls on there own as well but is a little bit of a annoyance fro any of them. 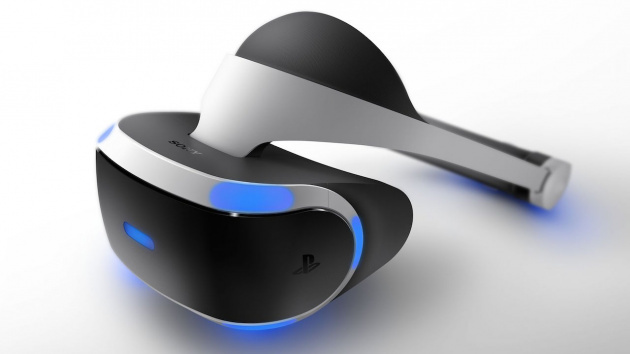 The specs of PSVR is as followed OLED Screen at 5.7 inches with a resolution of 1920 x RGB x 1080 (960 x RGB x 1080 per eye), refresh rate of 120hz, sensors 360 degree tracking / 9 LEDs, Field of View Approx 100 degrees, Latency less then 18 milliseconds which means the resolution is less then both Vive and Rift but the refresh rate is higher which to me sounds good having a screen so close to my eyes. Now on to thing that makes any new platform worth getting and that's games, Sony says there will be 50 games out in the launch window of 2016 and there 230 developers working on VR experiences for PSVR. PlayRoom VR as it has shown the social side of VR in a way similar to the Wii U and gamepad where person uses the PSVR & the rest use the TV to play. It looked like the person using the VR was a giant dinosaur where the guys using the TV where the little robots trying to escape. VR Worlds which is 5 sort of tech demos in one which includes London Heist and Into the Deep, this like a PlayRoom VR and things like NintendoLand on the Wii U on what you can do with the system. Battlezone which I played at EGX, it was fine to play but seemed to lack purpose but now has a story mode as to why I'm going around in my tank. Golem from some guys that made Halo, you play as girl who has lost her use of her legs but finds away to use magic and control Golems. PSVR and the premise kinda suits as your the girl sat at home then putting the VR headset on your taking over the Golem like she is. Star Wars VR, the PSVR uses Move will we finally get a decent lightsaber experience. Until Dawn Rush of Blood, I loved Until Dawn but RoB does look a little underwhelming but we will see how it turns out. The last thing is that it was announced there will be a cinema mode like how the Rift can work with the Xbox One, that any game or anything the PS4 can do, can be viewed on the PSVR headset. I haven't seen what this looks like but I have seen it on Xbox One and the screen looked so far away (screenshot) that I'm no sure if it is a feature I will use but Sony have said there will be 3 levels of zoom, that I will certainly try it. Ohh and everything on the PSVR will also been shown on the TV screen, that I'm not sure tat it can't be streamed on Twitch of what is my TV screen like it is now. If so that's big as well as I've heard people say about how there going to do let's play and record VR stuff for reviews but if you can stream like that then it solve a lot of things. The PSVR will be here in a months time and within this pay packet by one day (I could just wait and pick it up on the 14th instead of midnight of the 12th but No), now I will likely stream me playing and EofGiz may even film me looking like a idiot with the headset on. The thing is I did think we wouldn't get many launch games but the "50 games" coming this year for it would be spread out with something like 3 a week on PSN but nope were getting typical lots at launch. I'm not sure what to get alongside PSVR, some of the games are cheap like £8 for Tumble VR and some are full £49.99 RRP like RIGS. That's a few I know at the moment, what do you guys think I should pick up alongside my PSVR?